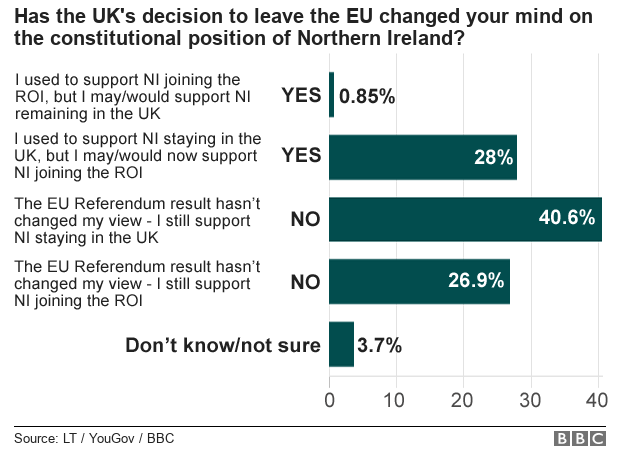 The result represents a much narrower lead for the pro-UK camp than another survey carried out for Belfast's Queen's University in May, which suggested 50% backed the UK, whilst only 21% favoured a united Ireland. The Queen's poll was conducted face-to-face by Ipsos Mori, whilst the BBC survey was carried out online and over the telephone by LucidTalk. LucidTalk's Bill White believes the online survey method may catch more "shy" united Ireland supporters than face-to-face interviews. In the Lucid talk survey, support for a united Ireland is stronger amongst younger voters. Amongst those surveyed under the age of 45, 49% backed a united Ireland and 38% preferred staying in the UK. The remaining 13% were undecided. 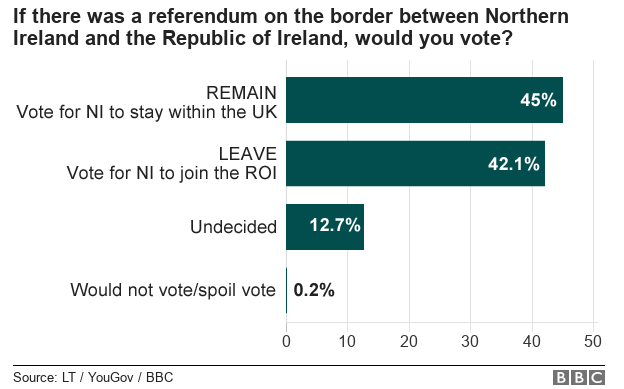 It looks to me that now Britain is leaving the EU, many of the Catholics in NI are feeling more 'cut off' from the south, so that has pushed them into wanting a united Ireland. I think it might well happen in about 10 years. It depends if brexit is a success. You never can tell. I'm not feeling confident with those in control now and I feel it could all take a terrible turn for the worst if labour takes power. @frankhammer wrote: It depends if brexit is a success. You never can tell. I'm not feeling confident with those in control now and I feel it could all take a terrible turn for the worst if labour takes power. TPTB will make sure to get their way no matter how people vote. I would rather NI and Ireland unite as one country, though. I think the present division is unnatural, although there are probably good reasons for it. What's next. Spain, Italy, Brasil or the US. China and India will be quietly happy with these results. That's a point I make. A lot of people (on the internet) who call themselves nationalists/patriots seem to think it would be grand for every country to splinter into regional, flag-waving parts. I don't know why. Nations formed in the first place out of competing petty kingdoms and eventually settled down into stable realms with strong defences. In the case of Northern Ireland, I don't think it really matters if stays with England or goes - it's really just a matter of tribal pride. But I wouldn't want Great Britain to break apart. I think it would have to be called 'Britain' to satisfy the Welsh. 'England and Wales' would be embarrassing. I think it's interesting how nearly every European country is really a conglomerate of smaller countries. I was reading about Estonia, and it's the combination of four kingdoms. I thought, really? Estonia? That little country up in the NE of Europe that doesn't get much attention? Then there is tiny Belgium, two countries in one, really. A united Ireland and UK (the Isles) should be the western European coastal fortress along with the main trade entry to the same region. If they played their cards right. The 200nm eez alone has immense resources. Are there no big picture thinkers, movers and shakers left? @OsricPearl wrote: I think it's interesting how nearly every European country is really a conglomerate of smaller countries. I was reading about Estonia, and it's the combination of four kingdoms. I thought, really? Estonia? That little country up in the NE of Europe that doesn't get much attention? I could look it up and become informed within ten minutes, but without doing so, I don't know why Portugal is a separate country anyway. There's no obvious geographical separator. There was somebody in a paper recently saying how poor high school history education is these days. All they really learn about here is World War 2 and Henry VIII.